Flash takes on Ming the Merciless... again! Action figures based on the iconic Flash Gordon movie of 1980. Direct to you from the planet Mongo! Articulated. Real fabric outfits. Retro 1970s figure design. Good vs. evil... again. Direct to you from the planet Mongo, Bif Bang Pow! 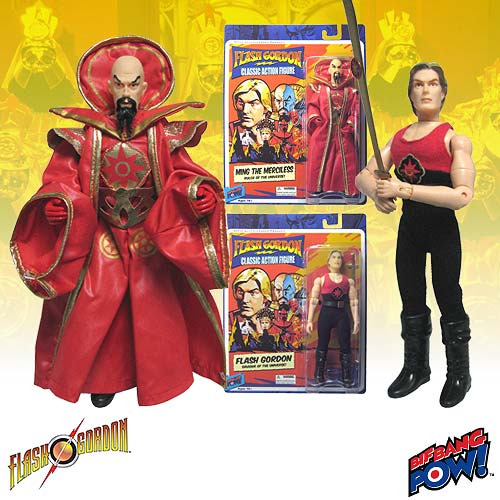 presents retro-styled action figures based on the iconic Flash Gordon movie from 1980! Sporting a design reminiscent of action figures from the 70s, they stand 8-inches tall and feature movie-true fabric costumes and multiple points of articulation to go along with their amazing likeness to the film's characters. You're gonna love these!